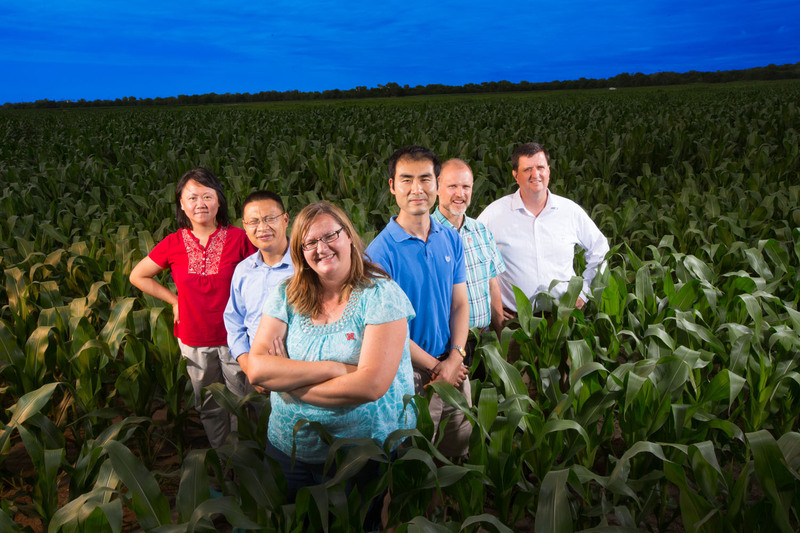 UNL climate change and groundwater quality team, from left: Yusong Li, civil engineering; Zhenghong Tang, community and regional planning; Shannon Bartelt-Hunt and Xu Li, civil engineering; Dan Snow, Nebraska Water Center; and Eric Thompson, economics. Not pictured, David Rosenbaum, economics. When droughts ravage agriculture, the role of climate change grabs headlines. But the climate’s impact on groundwater quality as food production adapts to a warming planet receives less attention. An interdisciplinary team of UNL researchers is investigating the climate’s effect on groundwater contamination from chemicals used in crop and animal production, including indirect effects from land use changes. “We were surprised at how little information there is about how climate will impact groundwater quality,” said project leader Shannon Bartelt-Hunt, an associate professor of civil engineering based at the Peter Kiewit Institute in Omaha. The researchers are focusing on atrazine, a widely used crop herbicide, as well as the antibiotic sulfamethazine and artificial hormone estrone, both used in animal production. Atrazine is applied directly to fields, while the other two may be in manure applied as fertilizer. They’re investigating how different climatic conditions affect the compounds’ behaviors and how they infiltrate soil. To study climate’s indirect effects, they’re developing economic models to understand how predicted climate changes will affect land use. Decreasing water availability in the southern Plains is expected to concentrate crop and animal production farther north, including in Nebraska, intensifying the use of these compounds. This ultimately could harm groundwater quality. “We hypothesize that those land use changes will have a greater impact than any direct effects of climate,” Bartelt-Hunt said. The team is creating a model linking economic and hydrological components that researchers and decision-makers can use to evaluate the effects of climate and land use changes on groundwater hydrology. A $600,000 Water Sustainability and Climate Program grant from a joint National Science Foundation-U.S. Department of Agriculture program funds this interdisciplinary project, which includes engineers, economists, water scientists and regional planners.